Got to hand it to the person that drew this comic - they went all in. Probably realized that no one is reading print newspapers anymore and threw up a YOLO comic. Hey man, we've been there. A lot less overt racism and crude artistic depictions of world leaders, but we've been there. 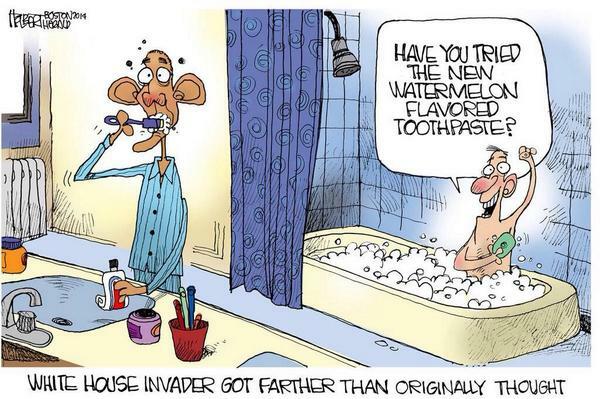 Like, yeah, we get what you're trying to say with the intruder bathing behind Barry's shower curtain, but the other stuff was up to a bit of "artistic interpretation." Aside from the obvious toothpaste jab, the monkey ears move was a "eh, I'm probably getting fired soon, let's get REAL racist with it." I'm not even that mad about this because at least it wasn't another black dude getting shot at by a cop. Any time that doesn't happen we have to chalk it up as a win in 2014. On a sidenote, I'm completely ok with the racist foods associated with black people. Watermelon? Refreshing and delicious. Fried Chicken? Possibly the best thing to ever happen to food. Grape flavored beverages? Tell me you won't do horrible things for a Welch's grape soda and I'll call you a liar to your face. Good thing Boston's not known for having a rich history of racial unrest or anything. Really dodged a bullet on that one.